Proprietary Name: Pain Relief Patches What is the Proprietary Name? Non-Proprietary Name: Camphor, Menthol, Methyl Salicylate What is the Non-Proprietary Name? 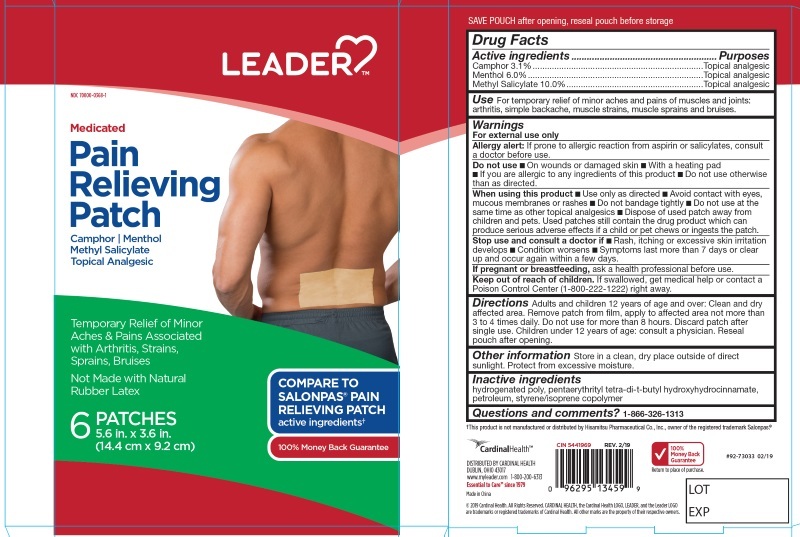 Pain Relief Patches with NDC 70000-0368 is a a human over the counter drug product labeled by Cardinal Health. The generic name of Pain Relief Patches is camphor, menthol, methyl salicylate. The product's dosage form is patch and is administered via topical form. Use only as directedAvoid contact with eyes, mucous membranes or rashesDo not bandage tighlyDo not use at the same time as other topical analgesicsDispose of used patch in manner that keeps product away from childrens and pets. Used patches still contain the drug product that can produce serious adverse effects if a child or pet chews or ingests this patch. For temporary relief of minor aches and pains of muscles and joints associated with arthritis, simple backache, strains, sprains, and bruises. Adults and children 12 years of age and over: Clean and dry affected area. Remove patch from film, apply to affected area not more than 3 to 4 times daily. Remove patch from the skin after at most, 8-hour application.Children under 12 years of age: consult physician. Other Information: Store in clean, dy place outside of direct sunlight. Protect from excessive moisture.